Glutamate-aspartate transporter is also known as GLAST. We are constantly working hard to ensure we provide our customers with best in class antibodies. As a result, we are pleased to offer this antibody in a purified format as of 23rd June 2017. The following lots are still unpurified and still in stock as of 23rd June 2017 - GR3178513-1,GR3173220-1, GR3173220-2, GR293270-1, GR320843-2, GR320843-3, GR313192-1, GR320843-1. Lot numbers other than GR3178513-1,GR3173220-1, GR3173220-2, GR293270-1, GR320843-2, GR320843-3, GR313192-1, GR320843-1 will be purified. Please note that the dilutions may need to be adjusted accordingly. Purified antibodies have the advantage of being enriched for the fraction of immunoglobulin that specifically reacts with the target antigen and for having a reduction of serum proteins. Our Abpromise guarantee covers the use of ab416 in the following tested applications. WB 1/200 - 1/5000. Predicted molecular weight: 60 kDa.Can be blocked with EAAT1 peptide (ab127026). Flow Cyt 1/10 - 1/200. Transports L-glutamate and also L- and D-aspartate. Essential for terminating the postsynaptic action of glutamate by rapidly removing released glutamate from the synaptic cleft. Acts as a symport by cotransporting sodium. Highly expressed in cerebellum, but also found in frontal cortex, hippocampus and basal ganglia. Defects in SLC1A3 are the cause of episodic ataxia type 6 (EA6) [MIM:612656]. EA6 is characterized by episodic ataxia, seizures, migraine and alternating hemiplegia. Belongs to the sodium:dicarboxylate (SDF) symporter (TC 2.A.23) family. SLC1A3 subfamily. ab416 staining zebrafish retina sections by IHC-Fr. The tissue was fixed with paraformaldehyde and an antigen retrieval step was performed with sodium citrate pH 6. Blocking of the sample was done with 5%BSA in PBS containing 01% Tween 20 and 0.5% Triton X, for 60 minutes at 23°C, followed by staining with ab416 at 1/100 in blocking solution for 16h at 4°C. 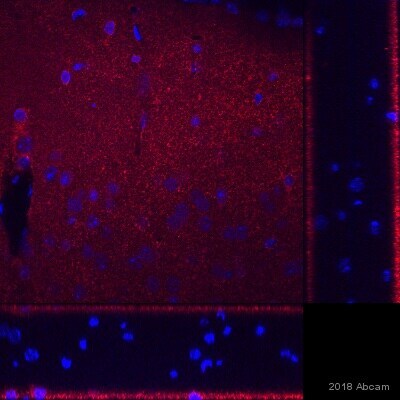 An alexa 488 conjugated goat anti-rabbit polyclonal antibody at 1/1000 was used as the secondary antibody. Nuclei are stained in blue with DAPI. EAAT1 expression can be observed in the inner plexiform layer (in green). 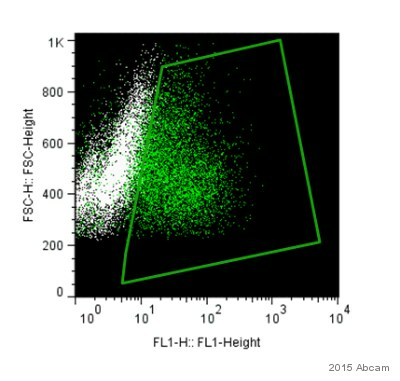 Flow cytometric analysis with ab416 at 1/300 dilution of differentiated human NSCs (green) and undifferentiated stem cells (white). Alexa Fluor© 488 goat anti-rabbit IgG, at 1/500 dilution was used as the secondary antibody. 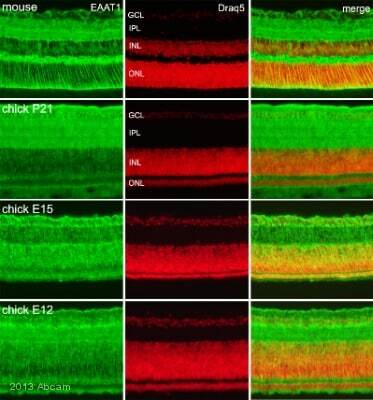 ab416 staining EAAT1 in Chicken retina cells by ICC/IF (Immunocytochemistry/immunofluorescence). Cells were fixed with paraformaldehyde, permeabilized with Triton X-100 0.02% in PBS and blocked with 5% serum for 16 hours at 22°C. Samples were incubated with primary antibody (1/500 in PBS + 0.02% Triton) for 16 hours at 22°C. An undiluted Alexa Fluor®488-conjugated Goat anti-rabbit IgG polyclonal was used as the secondary antibody. Immunohistochemistry (PFA perfusion fixed frozen sections) - Anti-EAAT1 antibody (ab416)Image from Barcia C. et. al., PLoS One. 2008 Aug 20;3(8):e2977 (Fig 8C). ab416 at 1/100 dilution staining EAAT1 in mouse coronal tissue sections by Immunohistochemistry (PFA perfusion fixed frozen sections). Adult Sprague–Dawley rats were injected intraperitoneally with pentobarbitone and were transcardially perfused-fixed with heparinized saline and 4% paraformaldehyde in PBS. Brains were removed, were postfixed in 4% paraformaldehyde for 5h, and were stored in PBS. Sections of each brain were pretreated with citrate buffer for 30 min at 65°C to increase antigen retrieval and penetration of the antibodies into the tissues. 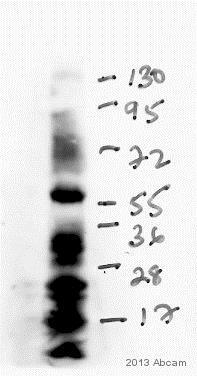 Sections were permeabilized with 1% Triton X-100 for 5 min and blocked with 3% normal horse serum in 0.1 M PBS, pH 7.4, for 60 min and incubated at room temperature for 48h with primary antibodies. An Alexa Fluor® 488 conjugated anti rabbit was used as secondary at 1/1000 dilution. 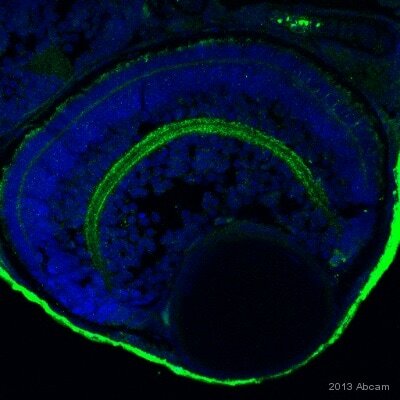 ab416 (1:500) staining EAAT1 in human cerebellum using an automated system (DAKO Autostainer Plus). Using this protocol there is strong staining of membrane cells in the purkinje glial region . 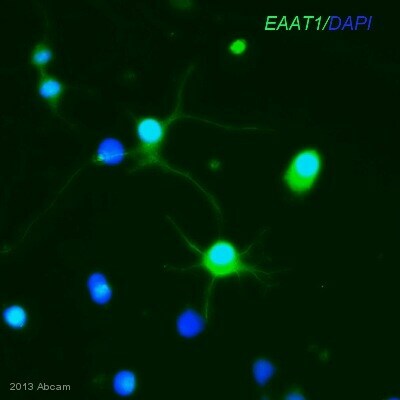 ab416 staining EAAT1 in Rat Astrocyte cells by ICC/IF (Immunocytochemistry/immunofluorescence). Cells were fixed with paraformaldehyde and blocked with 5% Serum for 10 minutes at 25°C. Samples were incubated with primary antibody (1/200) for 1 hour at 25°C. An Alexa Fluor®488-conjugated Goat anti-rabbit IgG polyclonal(1/300) was used as the secondary antibody. Publishing research using ab416? Please let us know so that we can cite the reference in this datasheet. This antibody is showing non-specific bands in WB. I am sorry this product did not perform as stated on the datasheet and for the inconvenience this has caused. As requested, I have issued a free of charge replacement from a different lot. I apologize, but I misspoke on the phone. This item will be shipping from our UK office, so you can expect to receive it on April 16th once it transfers to our Boston office.